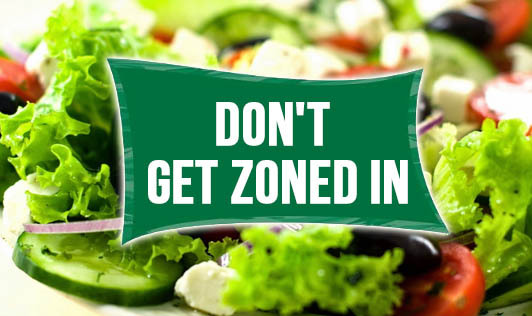 The Zone Diet was developed by Barry Sears, a former researcher in biotechnology at the Massachusetts Institute of Technology The basis for this diet is that if a person eats carbohydrates, protein, fat in the proportion (40:30:30), she will improve her health, weight and athletic performance, because certain hormones will be balanced and therefore in the preferred "zone". The majority of carbohydrates are supposed to come from vegetables and fruits, with starches (such as bread, potatoes, rice and pasta) used sparingly as condiments. Proteins are to be eaten with every meal and at every snack. Another aspect is supplementation with high-dose fish oil. The diet's goal is to keep a hormonal balance between insulin and glucagon by limiting the amount of certain food groups. The positive part is that this diet encourages its followers to eliminate foods many people overeat, such as sweets, chips, refined starches and junk food. On the downside, a higher protein and fat diet with lower carbohydrates creates its own set of health problems. This diet will help people lose weight, not necessarily because of any magic or miracle formula, but simply because it is low in calories. Although Dr Sears blames insulin resistance for weight gain, there is no clear evidence to say that is the cause for overweight in everyone. Zone Diet, like many other high protein diets, ignores the fact that a high-protein, high-fat, low-carbohydrate diet leads to higher rates of heart disease, stroke, hypertension, adult diabetes, and some types of cancer.